It’s blowing a storm outside today – Storm Henry, we’ve just gotten over Gertrude last Thursday. Thought last year was the year of the storms but this one’s picking up the pace. My son is home sick today and took great pleasure taking the above photo. New Fabrics Have Arrived (February Fabrics)! 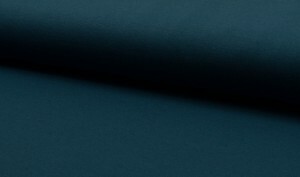 This post is supposed to be about new fabrics so here we go. The shelves at Dress Fabrics were looking bare at the beginning of the year. You guys bought loads a fabric coming up to Christmas and I used lots sewing up a storm of orders so I went and ordered in lots of lovely fabrics to replace the metres that were sold out and also as I am wont to do – expanded my range of colours and prints. I also may have added a few new fabrics to my cart in the interests of research – you know nice flowy light summery types …. Looking at you 100% Viscose that will look amazing made into a top or blouse. Not to be left out – this 100% cotton Chambray will be just so soft and lush as a dress, shirt or skirt.. But back to February Fabrics – ie suitable fabrics to wear in February. 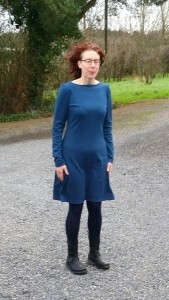 This dress I made from one of the new Ponte Di Roma shades I picked up – it’s a dark petrol. 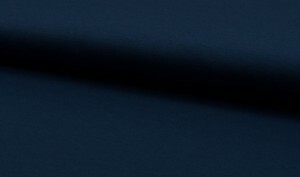 I also invested in a darker petrol / French Navy Shade – it’s also beautiful. I just have to sit on my hands and not go and make another dress for at least a few weeks!! The colours look very similar on the screen but the darker shade is much darker and the blue you can see in my dress picture! Another suitably snuggly February Fabric is this batty sweatshirting French Terry. Mix it with black or dark grey to make a cool sweatshirt or hoody. Suitable for kids and adults of all ages.. The Zebra Print sweatshirting also fell into my order – we sold out of this in November and have had lots of queries about it since so luckily the suppliers still had it in stock. This was only a quick round up – click on the New Arrivals tab on the website and you can browse all our new fabrics. You may have noticed that the title states February Fabrics Part 1 – well I’m sure you’ll be excited to know that I made another order just today and should have another shipment of beautiful fabrics this month!! So – go and sew!! Have a great week – I’ll be back soon with a general update on Dress Fabrics goings on!